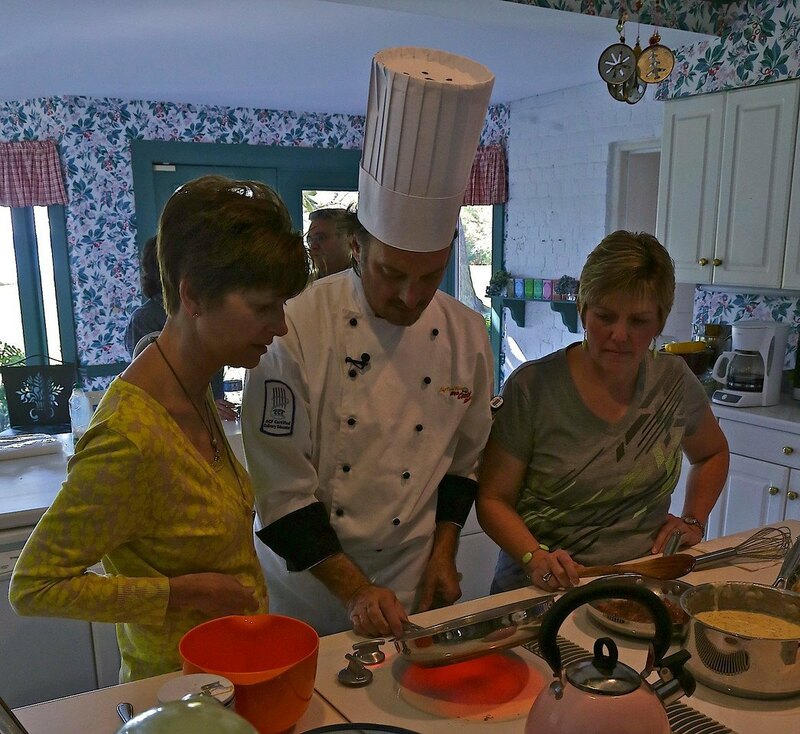 I Don’t Just Teach Cooking by Method… I Live It Everyday. Every day people tell me how learning to cook by method - the way I taught them - has changed their lives in ways they didn't even anticipate. This kind of feedback feels incredible, I'll admit it. You can cook for any diet without ever feeling like you are sacrificing taste and enjoyment. You can confidently cook fresher, healthier foods quickly enough for any schedule. You can buy top ingredients and still save money overall on your food budget. You can entertain with confidence knowing your guests will always be wowed and your work will always be simple. You can put a great dinner on the table every night that your whole family will praise. In fact, my Free Online Cooking Classes shows you in just 6 minutes how you can prepare a dinner worthy of being served by a professional Catering Company - just by learning to cook by method. What Does This Mean for You & Why Should You Care? This website was created so I can share my understanding of basic cooking methods with other curious-minded cooks. Through my free blog, free videos, and the free cooking webcasts I air from time to time, my goal is to give you the best combination of personalized culinary education with the convenience of online cooking classes. There is a lot of free information here and more is added every week! And for those really curious cooks who want to take their own cooking even higher and learn the skills that culinary students learn, all of my instruction provides the benefit of personalized education with the convenience (and cost-effectiveness) of online classes. All of my products were developed from my own needs and trials and tribulations in my own kitchen. This is an ever-evolving journey towards Culinary Enlightenment and we are on it together. Before I became Chef Todd Mohr, Certified Culinary Educator (CCE), I was a lot like you: Todd Mohr - a guy who liked to cook. A lot of people, including me, even thought I was a pretty good cook. For starters, I had my five meals that I could make well. And being a creative person, I also used some of the techniques from these tried and true recipes to experiment a bit with new dishes. I thought I enjoyed cooking, but in reality all of the unknowns were really holding me back from truly loving the time I spent in the kitchen. It was still a chore. I Finally Learned the Secrets that Freed Me from the #1 Stress of Cooking: Recipes! It's true! My recipes were only telling me what to cook. And, if you've ever tried to follow a recipe only to be disappointed with the result, you know that recipes leave a lot out! This was a major moment in my life because it changed the way I cook forever! Then - something even more incredible happened: I began cooking completely without recipes! I discovered things about cooking that I never would have known - things a recipe would never have taught me. and so I shared it among my friends and colleagues as much as I could (without driving everybody crazy). by learning this important skill we use EVERY SINGLE DAY! So how did I start teaching cooking? After culinary school, I did my kitchen time - all the way up to Executive Chef, taught a few semesters in a college culinary program, started and operated a successful catering company, and then finally, the culmination of all of my passion: opening The Cooking School in Cary NC in 2007. It was at The Cooking School that I developed and honed the cooking program that has now taught thousands of people to cook - something that had eluded them until they attended my classes or engaged in my online instruction. You see, people were telling me, "Chef Todd - I've bought cookbooks, watched videos, tuned into the Food Network - all in an effort to learn to cook, but I haven't really learned anything!" That's because this information is just not available without formal culinary instruction. When I started getting emails that my instruction had literally changed people's lives, I knew I was on to something and I just HAD to bring this to more people... so Web Cooking Classes was born! In addition to personally guiding cooks on this website, I also teach at my Culinary School alma mater and do as many live cooking events as I can. In early 2013, after a lengthy process, I completed a major goal of mine and became a Certified Culinary Educator (CCE) recognized by the American Culinary Federation. Despite my busy schedule, I read each and every email, comment, and question personally and respond to everything that needs a response. My passion is to teach others the life-changing effects of Cooking by Method so they may discover the many benefits for themselves. This is personal for me because I know it's very personal for you. The best way to connect with me is to click on one of the buttons above. You can also Comment on one of Blog posts, Write to me on Facebook or Twitter or Submit a Contact Form. But please do keep in touch. After all, we are on this journey together and I need to know how you're doing! © 2009 - 2019 Web Cooking Classes · All Rights Reserved.